Donald Trump's obiter dicta on war and the military role of the US in the world have sparked much comment. And as does almost all discussion of military matters, the conversation has moved quickly to the Iraq War. The recent Chilcot report on British participation in that war elicited embarrassing responses by British and Australian leaders and apologists of the time. Specious justifications were accompanied by a failure to take responsibility for the consequences of the invasion. In his recent Quarterly Essay ('Firing Line: Australia's Path to War'), too, James Brown acknowledges the military and political shambles that was the Iraq War, but endeavours to move beyond it in order to encourage hard thinking about military operations undertaken by Australia. In contrast to the apologias, Brown's work is thoughtful, responsible, rigorous and adult. But like them it puzzlingly lacks any explicit consideration of ethical issues raised by war. Brown offers a soldier's perspective. He believes, as any soldier must, that governments are responsible for keeping their people safe and that the military must act when directed by the government. He also argues that if they are to act responsibly, governments must constantly review possible future threats, devise plans to meet them, and provide resources adequate to purpose. Because the Australian assessment of threats always involves study of relationships between nations, the government cannot meet them alone. It must act in concert with other nations on whom it can call and by whom be called. Since decisions on military action must often be made quickly in response to a crisis the prime minister must be able to make them without prior reference to Parliament. But if he is to act responsibly he needs to be supported by informed groups of advisors. The decisions should also be ratified by a properly informed Parliament. Brown makes it clear that by these criteria Australian practice has been sloppy, discontinuous and idiosyncratic. "I find it surprising that the criteria fail to include the stipulation that intervention be shown to be ethically justified." He also outlines rigorous criteria that should inform any decision to use military force. It should be in the national interest, have a clear political goal to which the military action is linked, convince people that it is in their interest to stay in for the long haul, and be based on a clear understanding of the costs to country, civilians, soldiers and the enemy. It must also be preceded by assessment of its potential dangers and of the options that acting or failing to act will foreclose, and secure bipartisan commitment. Finally, there must be a clear understanding of how the military campaign will end. All these conditions are necessary. But I find it surprising that the criteria fail to include the stipulation that intervention be shown to be ethically justified. Although they help inform a moral judgment, they are essentially pragmatic and procedural, testing whether the military action is recklessly entered, as the Iraq invasion was, and whether policy goals of military intervention are properly aligned with the means used. But whether the goals and the means themselves are morally justifiable is not considered relevant. This lacuna does not argue to lack of moral sensitivity. The criteria offered are necessary to maintain a scrupulous attention to ethical behaviour in the conduct of war. But they fail to ask whether the war should have been entered in the first place. Brown, of course, would argue that this is not for a soldier to decide. But it is a proper and necessary question for leaders and citizens to ask. The inadequacy of the pragmatic criteria offered by Brown emerges if we test them against the early stages of Hitler's war in Europe. Lebensraum and freedom from the restrictions imposed after the Great War could have been argued to be in Germany's national interest. The Anschluss and the occupation of Danzig and Czechoslovakia secured that national interest, and the invasion of Belgium and France safeguarded it. It is quite possible that the costs of these military actions were weighed and found acceptable. The war certainly had popular support, the policy of the Opposition was irrelevant, and the end, an enlarged Germany, dominant in a pliant Europe, would have seemed both clear and attainable. But the war would still have been ethically unjustifiable. National interest alone does not suffice. It must be legitimate national interest, the legitimacy depending on the moral claims of other groups and nations. The costs of the war to citizens, cultures, and soldiers both during the war and afterwards need not only be understood, but be judged proportionate to the gains for humanity. All other means must also be exhausted. These amplifications of the criteria insist that the legitimacy of military action must take account of a broad set of interacting human values. 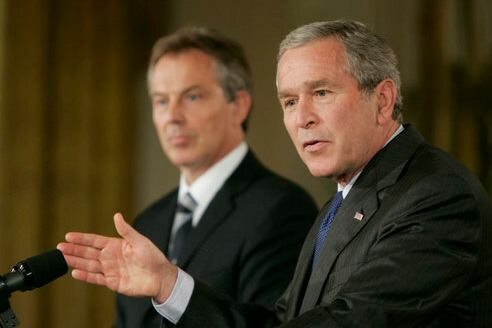 The defects of the Iraq invasion and the moral irresponsibility of those who collaborated in it and celebrated it did not flow solely from its procedural inadequacies. They came out of its moral crudity: Sadam was seen as an evil whose removal justified all means and consequences, and the United States was seen as an ally whose war making was to be supported whether or not it was ethically justified. The crudity now attributed to Donald Trump flourished before him among Washington insiders. The American military has used all kinds of lies and propaganda to justify the invasions of dozens and dozens of countries which are rich in oil and other coveted resources. None of those countries was intent on warring against America.That pragmatic list of hypothetical reasons for such cruelty and barbarity is criminal in all aspects and it's lack of morality and compassion is unforgivable. Where retaliation against invasion and genocide may be the only means of survival, premeditated war can NEVER be justified. For a so-called Christian country America has broken too many of the Commandments. Australia has no right to join in the massacres and theft.